Guenons (tribe Cercopithecini) are a species-rich group of primates that have attracted considerable attention from both primatologists and evolutionary biologists. The complex speciation pattern has made the elucidation of their relationships a challenging task, and many questions remain unanswered. SINEs are a class of non-autonomous mobile elements and are essentially homoplasy-free characters with known ancestral states, making them useful genetic markers for phylogenetic studies. We identified 151 novel Alu insertion loci from 11 species of tribe Cercopithecini, and used these insertions and 17 previously reported loci to infer a phylogenetic tree of the tribe Cercopithecini. Our results robustly supported the following relationships: (i) Allenopithecus is the basal lineage within the tribe; (ii) Cercopithecus lhoesti (L'Hoest's monkey) forms a clade with Chlorocebus aethiops (African green monkey) and Erythrocebus patas (patas monkey), supporting a single arboreal to terrestrial transition within the tribe; (iii) all of the Cercopithecus except C. lhoesti form a monophyletic group; and (iv) contrary to the common belief that Miopithecus is one of the most basal lineages in the tribe, M. talapoin (talapoin) forms a clade with arboreal members of Cercopithecus, and the terrestrial group (C. lhoesti, Chlorocebus aethiops and E. patas) diverged from this clade after the divergence of Allenopithecus. Some incongruent loci were found among the relationships within the arboreal Cercopithecus group. Several factors, including incomplete lineage sorting, concurrent polymorphism and hybridization between species may have contributed to the incongruence. This study presents one of the most robust phylogenetic hypotheses for the tribe Cercopithecini and demonstrates the advantages of SINE insertions for phylogenetic studies. Guenons (tribe Cercopithecini) are a species-rich group of primates with a distribution throughout sub Saharan Africa. With their diverse morphology, ecology, behavior and social organizations, guenons have attracted considerable attention from both primatologists and evolutionary biologists [1, 2]. In addition, some species in the tribe (e.g. Chlorocebus aethiops) have been widely used in biomedical studies [3–5]. Based on Groves' classification , the tribe Cercopithecini consists of five genera (Erythrocebus, Chlorocebus, Cercopithecus, Miopithecus and Allenopithecus) comprising 36 species. The evolutionary history of guenons may include a rapid basal radiation, and it is very likely that speciation is an ongoing process within the tribe [1, 7]. This complex speciation pattern has made the elucidation of the species relationships a challenging task, and many questions remain unanswered about the tribe composition (e.g. inclusion of Allenopithecus in the tribe), genera definitions (e.g. whether to consider Chlorocebus as a separate genus) and in particular, the phylogenetic relationships among genera and species [6, 8, 9]. • (i) is genus Cercopithecus paraphyletic and what are the species relationships within the genus? • (ii) what is the branching order of the major groups? Regarding the first question, Cercopithecus was previously considered to be a monophyletic group , but recent molecular [7, 13, 14] and karyotype studies  support grouping of the terrestrial taxa, Cercopithecus lhoesti species group, Chlorocebus and Erythrocebus, into a single lineage. This topology supports a single arboreal to terrestrial transition within the tribe, and divides the current genus Cercopithecus into a paraphyletic group. For the phylogenetic relationships among the arboreal members of Cercopithecus, several types of molecular data, including X and Y chromosome DNA sequences, protein sequences and karyotypes, recognize a clade containing a cephus species group and a mitis group. X chromosome DNA and protein studies also support a neglectus + diana + mona group clade (see summary in Tosi et al ). Nevertheless, a robust phylogenetic hypothesis of lower-level relationships among arboreal Cercopithecus species is not yet confirmed, as there is discordant evidence [7, 9]. The other major remaining question is the relationships between the major groups within Cercopithecini. It is thought that the tribe can be divided into four major clades: an arboreal Cercopithecus clade, a terrestrial clade (C. lhoesti species group, Chlorocebus and Erythrocebus), Miopithecus and Allenopithecus. Miopithecus and Allenopithecus are usually considered to be the most basal lineages of the tribe [11, 15, 16]. Although recent studies [7, 14] have provided robust support for the most basal lineage position of Allenopithecus, the relationships of the other three major clades (i.e. the arboreal Cercopithecus clade, the terrestrial clade, and Miopithecus) remain unclear. A set of molecular markers that are independent of DNA sequence data may help to resolve these phylogenetic questions in guenons. Short interspersed element (SINE) insertions are a class of retrotransposons that integrate into a genome via an RNA intermediate . SINE-based phylogenetic systems were put into practice in the early 1990s [18, 19], and certain unique characteristics make them particularly promising for evolutionary analyses [20–23]. Briefly, SINEs are usually unidirectional characters, with the absence of the insertion being the ancestral state. Precise removal of SINEs is extremely rare after their fixation in the genome, and is very unlikely to happen in multiple genomes . In addition, SINE-based analysis does not rely directly on analyzing DNA sequence data, which makes SINEs an independent complement to traditional DNA-based molecular studies that focus on sequence substitutions. In recent years, SINE-based phylogenetic analysis has proven to be a powerful tool for various levels of phylogenetic studies, and many controversial phylogenetic relationships that could not be solved using traditional molecular data have been successfully elucidated [21–23]. Alu elements are the most successful SINEs in primate genomes in terms of copy number. During primate evolution, Alu elements have proliferated in all primates and expanded to more than one million copies in the human genome [25, 26]. Several studies have been conducted to infer primate phylogenetic relationships using Alu elements, including the human, chimpanzee and gorilla trichotomy , Old World  and New World monkey phylogeny , tarsier affiliation , and strepsirrhine phylogeny . Using a combination of computational data-mining and PCR-based display methods, we identified 168 Alu insertion loci, which contained a total of 179 Alu insertions that had integrated into 11 cercopithecine genomes at various times. These insertions were used to construct a robustly supported phylogenetic hypothesis for the tribe Cercopithecini. The major relationships are: (i) Allenopithecus is the basal lineage of the tribe; (ii) C. lhoesti (L'Hoest's monkey) forms a clade with Chlorocebus aethiops (African green monkey) and E. patas (patas monkey), supporting a single transition to a terrestrial lifestyle; (iii) all Cercopithecus species except C. lhoesti form a monophyletic group; and (iv) contrary to the usual hypothesis that Miopithecus is one of the most primitive lineages in the tribe, our results suggest that the divergence between the arboreal Cercopithecus group and M. talapoin happened after the divergence of the terrestrial group. In total, 168 loci were selected for the phylogenetic analysis. Of these, 144 were identified using PCR display methodology, 7 were collected from available African green monkey (Chlorocebus aethiops) genomic sequences using a computational data mining approach (see Methods for details) and 17 loci were selected from a previous study . All loci were genotyped on a primate panel composed of 12 Old World primate species (Table 1), including 11 species within tribe Cercopithecini, with Pygathrix nemaeus (red-shanked Douc langur) as the outgroup. 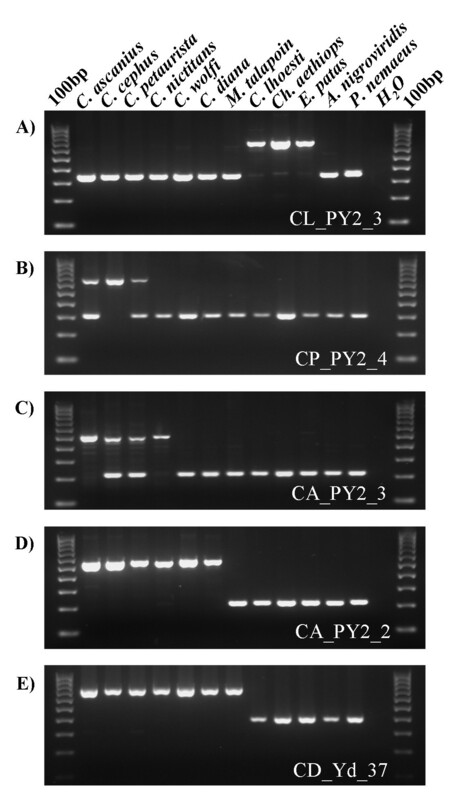 Gel electrophoresis results of five amplifications are shown in Figure 1. For the potential informative loci (i.e. loci in which more than one but not all species showed Alu insertion-sized amplicons), all of the PCR amplicons that appeared to have Alu insertions were sequenced to verify the presence of the Alu elements. DNA samples of all species examined in this study. * Integrated Primate Biomaterials and Information Resource, http://www.ipbir.org. † Blood sample from Dr. Anthony Tosi. ‡ Cell line provided by the American Type Culture Collection. § Frozen Zoo®, San Diego Zoo, http://conservationandscience.org. Phylogenetic analysis of Alu insertion polymorphisms in guenon genomes. 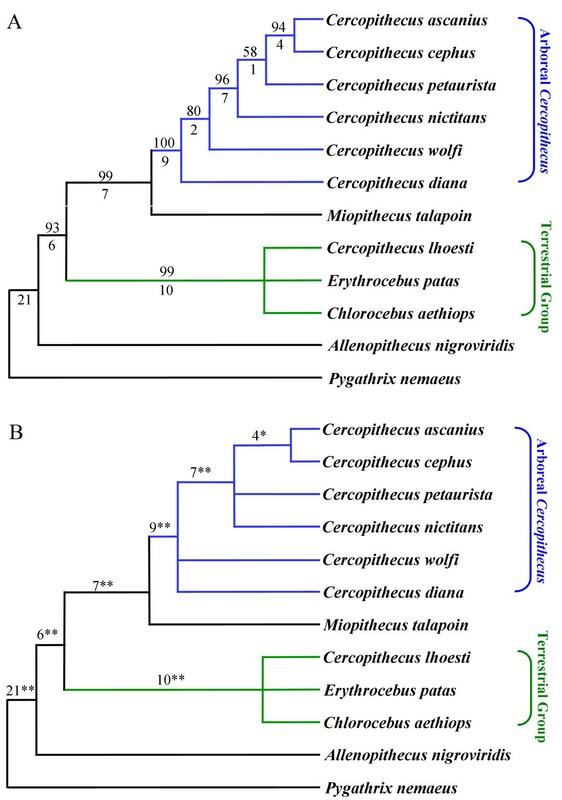 Gel electrophoresisresults of five amplifications used to determine the phylogenetic origin of individual Alu insertions in Cercopithecini species are shown. Upper DNA fragments indicate "filled" sites where Alu elements have inserted, and lower fragments indicate "empty" sites containing no Alu insertion. The DNA template used in each reaction and the locus designation are shown. (A) An Alu insertion specific for terrestrial guenons (C. lhoesti, Chlorocebus aethiops and E. patas); (B) An Alu insertion restricted to the cephus species group (C. ascanius, C. cephus and C. petaurista); (C) An Alu insertion clustering the cephus species group and C. nictitans; (D) An Alu insertion restricted the arboreal Cercopithecus group; (E) An Alu element present in the arboreal Cercopithecus group and M. talapoin. The sequencing verification recovered 11 loci that contained adjacent independent insertion events (i.e. independent insertions in different species that are within sufficiently close genomic proximity to be amplified by a single set of PCR primers; see Discussion for details). These adjacent independent insertion events were treated as independent markers in the subsequent analysis. Overall, 179 markers were used for the phylogenetic analysis. For presence/absence characters in which the absence of the marker is assumed to be the ancestral state, Dollo parsimony is the most appropriate analysis. Therefore, we implemented an exhaustive search using Dollo parsimony, designating P. nemaeus as an outgroup taxon. The analysis indicated that 78 loci were parsimony informative and resulted in two most parsimonious trees; the strict consensus for these two trees is shown in Figure 2A (219 steps, consistency index = 0.817; homoplasy index = 0.183; retention index = 0.802). A likelihood test for every branch  and 10000 bootstrap replicates were performed. The significance level and the percentage of bootstrap replicates supporting each branch are indicated. A collapsed version of this tree is shown (Figure 2B), in which branches that did not garner statistically significant support based on the likelihood test were collapsed into polytomies. Cladograms of tribe Cercopithecini phylogenetic relationships derived from Alu insertion polymorphisms. The blue section of each phylogeny indicates species of Cercopithecus with an arboreal lifestyle and the green section indicates species with a terrestrial lifestyle. (A) The strict consensus of the two most parsimonious trees from analysis of 179 Alu insertion polymorphisms. The numbers above the branches indicate the percentage of bootstrap replicates (10000 iterations) producing trees that include that node. Numbers below the branches indicate the numbers of unambiguous insertions supporting each node. (B) The collapsed version of tree A. Branches that did not gain statistically significant support in the likelihood test  were collapsed into polytomies. The significance level of each node is indicated by either * (p < 0.05) or ** (p < 0.01). We identified 10 Alu insertions shared by C. lhoesti, Chlorocebus aethiops and E. patas. This result strongly supported (p < 0.001)  the monophyly of the terrestrial group and the paraphyly of the previously defined genus Cercopithecus. This result is congruent with the single transition hypothesis, which states that there was only one transition from an arboreal to terrestrial lifestyle within the tribe [7, 14, 33]. Unfortunately, we did not identify enough informative markers to gain significant support for the relationships between taxa within the terrestrial group. Given the unambiguous clustering of a single terrestrial clade, our results support the division of the tribe Cercopithecini into four major clades: the arboreal Cercopithecus species, a terrestrial clade, Miopithecus, and Allenopithecus. Six Alu insertions were shared by all taxa except A. nigroviridis. This unambiguously placed Allenopithecus as the basal lineage within the tribe (p < 0.01). Another seven insertions joined M. talapoin to all arboreal Cercopithecus species (i.e. C. ascanius, C. cephus, C. petaurista, C. wolfi, C. diana and C. nictitans). These results suggest that the terrestrial group diverged after Allenopithecus but before the separation of Miopithecus from the arboreal Cercopithecus species (p < 0.01). The divergence of Miopithecus and the monophyly of the six arboreal Cercopithecus species were supported by nine Alu insertion loci present in all arboreal taxa but not in Miopithecus (p < 0.01). Of the six arboreal Cercopithecus species we tested, two clades were well supported. C. ascanius and C. cephus were clustered together to the exclusion of C. petaurista, based on four Alu insertions (p < 0.05). The C. ascanius and C. cephus clade was linked to C. petaurista and C. nictitans by seven insertions to form a polytomy (p < 0.01). Despite the relatively strong support for these two nodes, we should note that there were loci that supported alternative topologies among the arboreal Cercopithecus species. For example, when the affiliation of C. diana is considered, Alu insertions present in C. diana suggested at least four alternative phylogenetic hypothesis (Figure 3). Two Alu insertions (TA26 and CD_Yd_40) grouped C. diana with C. ascanius, C. cephus and C. petaurista, but not C. nictitans. In contrast, two other Alu elements (CD_Yd_27 and CN_PY2_53A) were found only in C. diana and C. nictitans. 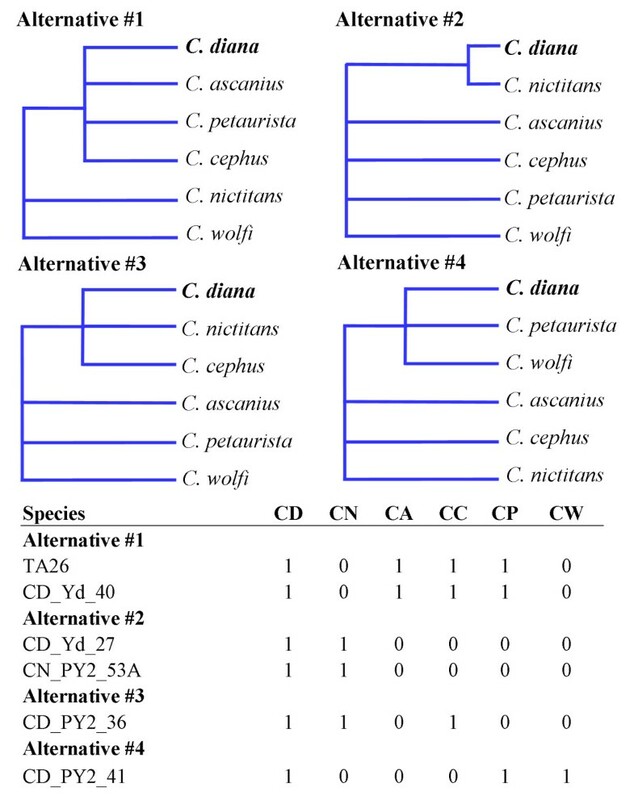 In addition, one marker (CD_PY2_36) supported the grouping of C. diana, C. nictitans and C. cephus, and one marker (CD_PY2_41) grouped C. diana, C. wolfi and C. petaurista together. Owing to this incongruence and the small number of makers supporting each hypothesis, none of these hypotheses gained statistically significant support using the likelihood test. Alu insertions support different phylogenetic hypotheses for the affiliation of C. diana. Four alternative hypotheses and the markers supporting each hypothesis are shown. Presence of the insert was coded as "1" and absence of the insert as "0". CD, C. diana; CN, C. nictitans; CP, C. petaurista; CA, C. ascanius; CC, C. cephus; CW, C. wolfi. Another noteworthy result is that a number of Alu insertion loci appeared to be heterozygous in certain species (e.g. both a filled band and an empty band are present) (Figures 1B and 1C). Several mechanisms, including incomplete lineage sorting, concurrent polymorphism and introgression may have contributed to this finding. Our results indicate that Allenopithecus is the most basal lineage of the tribe. A monophyletic terrestrial clade comprising C. lhoesti, E. patas, and Chlorocebus aethiops was the next to diverge from other guenons after the split of Allenopithecus, and Miopithecus subsequently diverged from the rest of arboreal Cercopithecus. This placement of Miopithecus represents a major difference compared with other phylogenetic analyses of the Cercopithecini. Despite the general view that Miopithecus may share some primitive features of the group (e.g. sexual swelling), no studies to date have provided robust support for a definitive placement for Miopithecus. For example, in a study using Y-chromosome DNA data , a four-way polytomy for Allenopithecus; Miopithecus, a terrestrial clade and an arboreal Cercopithecus clade was obtained. Studies using X-chromosome sequences identified Allenopithecus as the most basal lineage of the tribe, although a three-way polytomy consisting of Miopithecus, the terrestrial clade and the arboreal Cercopithecus clade persisted [7, 14]. Our results represent the first statistically significant support for the clustering of Miopithecus with the arboreal Cercopithecus clade. Owing to rapid speciation and the resulting close relationships within the genus Cercopithecus, a detailed lower-level hypothesis of relationships has been lacking. To date, the only robustly supported relationships are the separation of a cephus group + mitis group clade, and a neglectus + diana + mona group clade [7, 14]. In the current study, several relationships within the genus are supported by Alu insertions that have statistical support. For example, the clustering of C. ascanius and C. cephus within the cephus group (represented in this study by C. ascanius; C. cephus and C. petaurista) is well supported. The close relationship between the mitis group (represented here by C. nictitans) and the cephus group is also strongly supported. The diana group (represented here by C. diana) appears to be basal within the arboreal Cercopithecus clade. However, this hypothesis deserves further investigation, owing to the relatively low level of support for the placement of C. wolfi. Overall, these results are in good agreement with previous studies using X and Y chromosome DNA data, and provide robust independent evidence for the suggested relationships [7, 14]. Our results provide strong support for a single evolutionary transition from arboreality to terrestriality within the tribe Cercopithecini. The inference of a single transition to a ground-dwelling lifestyle suggests that such changes in substrate preference are probably rare in the history of the primates and therefore may lend greater significance to a similar change at the beginning of the hominin radiation. In addition, the guenon transition to a terrestrial lifestyle is estimated to have occurred at the Miocene/Pliocene boundary . This is significant because the same time window brackets the origins of hominin terrestrial bipedalism. Thus, similar factors may have driven early human ancestors and the terrestrial guenon progenitor to a largely ground-dwelling way of life. There are three major scenarios in SINE-based phylogenetic analyses that can lead to confounding results: adjacent independent insertions, incomplete lineage sorting, and hybridization between species. Adjacent independent insertions refer to the scenario that in different species, different Alu elements are inserted in close genomic proximity and are therefore amplified within the same PCR amplicon during genotyping. In this study, we sequenced all informative loci to confirm that the appropriately size amplicon contained the same Alu insertions, and all loci containing parallel independent insertions have been excluded or treated as independent markers (see Results section). Therefore, the incongruence observed in our current dataset cannot be explained by invoking this explanation. Incomplete lineage sorting is caused by alternative fixation/elimination of ancestral polymorphisms in populations of daughter lineages. Observations of incomplete lineage sorting can be particularly problematic when examining taxa that have undergone rapid bursts of speciation [22, 34]. It is believed that the tribe Cercopithecini diverged from tribe Papionini about 11 million years ago [7, 35]. However, owing to the lack of fossil evidence, the divergence times of subsequent groups are less certain. For the arboreal Cercopithecus clade, multiple speciation events may have occurred during a very short period to create the six species groups, containing the >20 species we see today . If that is the case, many polymorphic Alu elements present in the guenon ancestral population have the potential to remain polymorphic before, during, and after these speciation events. These insertions were eventually fixed in or lost from the genomes of daughter species, and may have resulted in the incongruent insertion presence/absence patterns observed. Finally, occasional introgressions via hybridization present yet another hypothesis to explain the incongruent Alu patterns. The ranges of closely related species within many guenon species groups often overlap geographically, and many of these species are known to hybridize with each other. For example, it is known that hybridizations occur between the red-tailed monkey group (cephus species group) and the blue monkey group (mitis species group, represented here by C. nictitans) in their contact zones . These hybridizations may have contributed to the polytomy of C. ascanius, C. cephus, C. petaurista (the cephus species group) and C. nictitans (the mitis species group) in our study. In fact, introgression may even have introduced certain Alu insertion loci into species other than the arboreal Cercopithecus clade and provide a plausible explanation for some of the incongruent results in our study. Based on 179 Alu insertions, a robust phylogenetic hypothesis has been constructed and the placement for Miopithecus is inferred with statistically significant support for the first time. In addition, our observations indicate that the group of arboreal Cercopithecus species may have experienced a series of rapid, even simultaneous, speciation events, and thus a number of Alu insertions have been randomly fixed in different lineages. Hybridization between different species in the tribe may have also contributed to the complex patterns in our dataset. Owing to the unidirectional insertion property and extremely low removal rate of fixed SINE insertions, these markers can be used to construct phylogenetic hypothesis with high statistical power and provide evidence independent to sequence-based molecular phylogenetic studies. Genomic sequences from Chlorocebus aethiops(African green monkey) were obtained from the NIH Intramural Sequencing Center , as part of the Comparative Vertebrate Sequencing Initiative. The sequences were broken into 10000-bp fragments and compared with the human genome (hg18) and the rhesus monkey genome (rheMac2) using the BLAST-Like Alignment Tool (BLAT) . Fragments containing insertion/deletions were extracted and annotated to identify putative lineage-specific Alu insertions using previously reported methods . In order to allow a focus on the cercopithecine lineage, only Alu elements present in the Chlorocebus aethiops sequence but absent in the orthologous regions of the rhesus monkey genome were excised along with 1000 bp of flanking sequence in both directions. Flanking oligonucleotide primers for PCR amplification of each Alu element were then designed using Primer3 software . The primers were subsequently screened against the GenBank NR database using the Basic Local Alignment Search Tool (BLAST) program  to determine if they resided in unique DNA sequences. The Alu element PCR-display methodology and Alu-specific primers described by Xing et al  were used for identifying species-specific Alu insertions. To prevent ascertainment bias, every cercopithecine species in this study was subject to this methodology and Alu insertion loci were identified from all species. Oligonucleotide primer pairs were initially tested using Chlorocebus aethiops DNA templates with a temperature gradient PCR (48–60°C) to determine the most appropriate annealing temperature for further analysis. All loci were screened against a primate panel that was composed of DNA samples from 12 Old World primate species (Table 1). Because the quantity of genomic DNA samples for most species is limited, all samples except Chlorocebus aethiops were subjected to whole genome amplification using the GenomiPhi genome amplification kit (Amersham, Sunnyvale, CA, USA) following the manufacturer's instructions. The amplified samples were then purified and divided into aliquots for locus-specific PCR analysis. PCR amplification of each locus was performed as described by Xing et al . The resulting PCR products were run on 2% agarose gels with 0.25 μg of ethidium bromide and visualized using ultraviolet fluorescence. Detailed information for each locus including primer sequences, annealing temperature, PCR product sizes, chromosomal locations and amplification results are available on our website (supplemental table. located under "Publications") . For the potentially informative loci, all PCR amplicons that appeared to have Alu insertions were subjected to sequence analysis to verify the presence of the Alu elements. Selected taxa from several uninformative loci were also sequenced to confirm the presence of the Alu elements. Individual PCR products were either directly sequenced or were cloned and sequenced as described previously . Sequences for each locus were aligned against rhesus monkey (when available) or human orthologous sequence obtained via the BLAT search. Sequence alignments of these loci are available from our website (supplemental table. located under "Publications") . The DNA sequences generated for this project have been deposited in GenBank (accession numbers DQ977747-DQ978210). Alu insertion loci were included in phylogenetic analysis if amplicons were generated in at least seven out of the 11 cercopithecine taxa in our panel, and only 2 distinct classes of amplicons were obtained (i.e. Alu filled size and pre-integration or Alu empty size). Any primer pair that generated multiple paralogous fragments across the panel was excluded from the analysis. We implemented an exhaustive search in PAUP* software (version 4.0b10)  using Dollo parsimony and designating the Pygathrix nemaeus as an outgroup taxon. Presence of the insert was coded as "1" and absence of the insert as "0". If no amplification was observed for a given locus in any taxon, the character state was coded as unknown ("?"). For loci containing adjacent independent insertion events, the independent insertions were treated as independent markers. In total, 10000 bootstrap replicates were performed on the data. A statistical test for evaluating SINE insertions based on a likelihood model  was also performed to assess the statistical significance of each branch of the resulting tree. We thank Dr Robb T. Brumfield, Dr Miriam Konkel and Thomas J. Meyer for their useful comments and critical readings during the preparation of the manuscript. This research was supported by the National Science Foundation grants BCS-0218338 (MAB) and EPS-0346411 (MAB), National Institutes of Health GM59290 (MAB), and the State of Louisiana Board of Regents Support Fund (MAB). DAR was supported by the Eberly College of Arts and Sciences at WVU. JX, AJT, TRD and MAB designed the study. JX, HW, YZ and DAR performed the experiments. JX and HW analyzed the dataset. MAB directed the project. All authors were involved in preparing the manuscript.